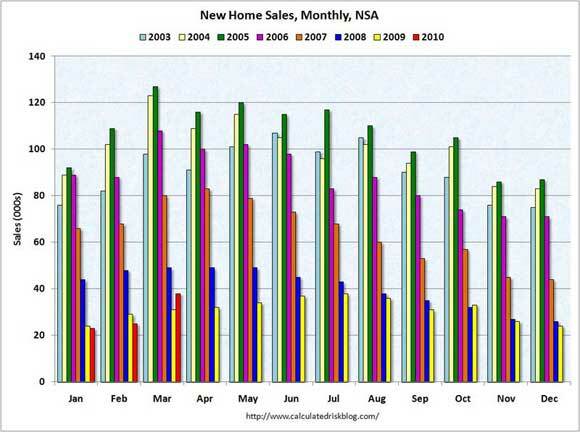 The economic data yesterday that got the market in a lather was an increase in new home sales. The financial press picked up on an increase in seasonal adjusted numbers. This report should be taken with caution by investors. New home sales drives new construction, and normally lifts the economy out of a recession. We are not seeing such a recovery, putting in doubt any claims of a sustainable recovery. The non-seasonally adjusted new home sales was only 38K. The lowest March on record is last year at 31K, only 7K different – and this year’s increase was boosted by yet another Cash4GDP program, in this case a second run of the first time homebuyers tax credit. (Data and charts from CalculatedRisk.) Before the credit was reinstated in March, new home sales had been below last year. Compare the yellow bars with the bright red ones in the chart below. The risk is when the program ends in April we fall below the 2009 level by more than the prior shortfall, as demand would have been pulled forward into March and April from sales that might have occurred anyway in May and June. The seasonally-adjusted number is 411Km – quite a difference, 10x higher, because it is annualized. (March usually is the best sales month, so the adjustment is less than a simple 12x.) Due to annualizing plus normalizing to prior years, a small increase in the non-adjusted numbers causes a large swing in the seasonal adjusted number. We see a jitter of a possible bottom in this next chart – or is it a mere sideways stall before a further decline, a triangle forming? Hard to generalize from this jitter to pronounce a housing recovery. 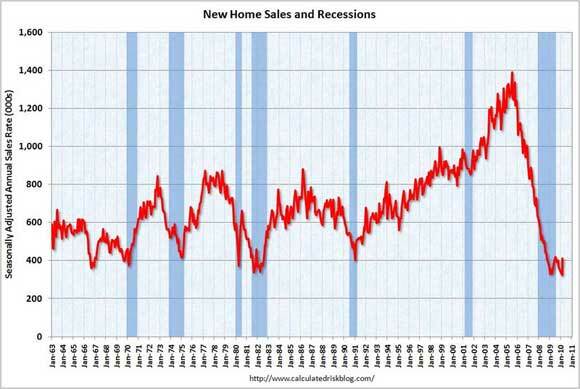 You can see, however, how new home sales drove rapidly up even before the end of the prior recessions. Not this time. The seasonal adjustments add noise to the reports, and new home sales themselves are noisy numbers with lots of fluctuations that disguise the trend. Yesterday the S&P warned that the non-seasonally adjusted numbers were more informative. This chart shows how the seasonal adjustments (purple) are swinging wider and irregular changes (green) are becoming a bigger part of the S&P’s Case-Shiller Index. 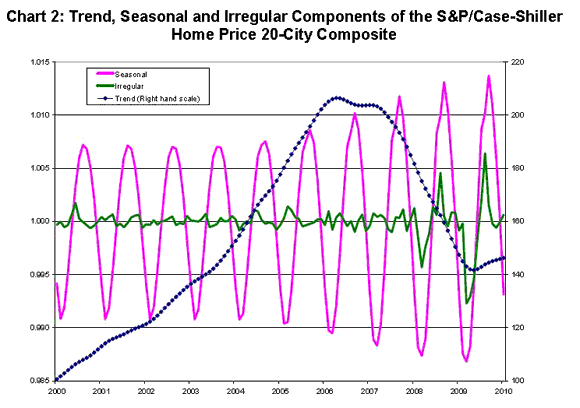 The S&P believes that the increase in irregular changes is driving wilder seasonal adjustments, making them unreliable. The bottom line is we cannot yet claim a recovery to the housing market. This next chart and accompanying analysis (from CalculatedRisk) shows a gap between the trends in new home sales vs existing homes. The initial gap was likely due to a flood of distressed sales. New homes could not compete. 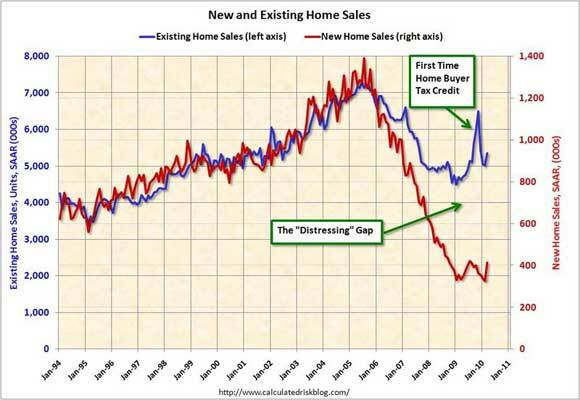 The big spike in existing home sales (blue line) was caused by the first homebuyer tax credit. The spike in new home sales (red line) was much smaller, and also came earlier. (New home data comes in when the contract is signed, while existing home data comes when the transaction is closed.) The second little red spike is happening now, ahead of a bigger blue spike. When the second homebuyer credit program expires in April, expect the new home sales to drop in May, and existing home sales to drop in July. The seasonally-adjusted numbers should exaggerate the drop, just as they exaggerated the impact of a slight rise. The timing will coincide with what I expect to be the Summer of Disillusionment with the economic recovery, after a pretty good reports of GDP growth in Q1 and Q2.